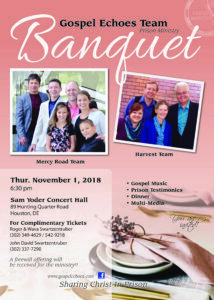 The Gospel Echoes will hold their annual Banquet at the Sam Yoder Farm, 89 Hunting Quarter Rd., Houston, DE, Thursday, November 1, 2018,6:30 PM. Call for complimentary tickets: Roger and Wava Swartzentruber 302-349-4692 / 542-9218 or John David Swartzwentruber 302-337-7290. The evening includes a delicious home cooked meal Gospel Music, and a prisoner testimony.